The Talmud states; “We don’t see things the way they are. We see things the way we are.” Obama is a popular President, no doubt about that, being re-elected fair and square despite getting an F in almost every sphere of decision making associated with his administration. Obama is also a classical narcissistic personality type, vividly expressed by his latest foray meddling in Israel’s coming election. Hiding behind his newest court Jew, Atlantic’s Jeffrey Goldberg, Obama has been unable to contain his rage and need to get even with Netanyahu. Obama’s assumption that he knows better than Netanyahu, better than Israel’s Knesset, and better than Israel’s voters is very much symptomatic of narcissistic types who generally exaggerate their own importance, achievements and talents. Obama’s tendency to setting goals that are unrealistic and wanting “the best” of everything is also typical of narcissistic types and reflects much of what’s gone wrong with Obama’s Middle East policies. Three days before Israel’s elections final polls published today will provide little comfort to President Obama. All the surveys of opinion before this Tuesday’s vote point in one direction: Netanyahu will win and win big time. That’s a bitter pill for Obama to swallow, believing as Atlantic’s Jeffrey Goldberg reported last week, that the President knows what is in Israel’s “best interests” better than Netanyahu. It’s not so surprising that Obama has shown rigid reluctance to get tuff with Iran, or get tuff with Syria, or get tuff with Islamists throughout the Middle East, yet has no gumptions about getting tuff with Netanyahu. What is it that Netanyahu has done to tick off Obama exposing his generally hidden narcissistic anger and rage. It just may be that a second term Obama is still eager for a confrontation and to get even with Netanyahu after Obama’s humiliation in May 2011. At the time the Israeli Prime Minister was invited to speak before both Houses of Congress, demonstrating brilliantly to Obama the consequences of picking a fight with a popular ally. At that time, Obama ambushed a visiting Netanyahu with a speech demanding that Israeli accept the 1967 lines as a starting point in future peace negotiations. Netanyahu convincingly rejected Obama’s demands, publicly rejecting the Presidential dictate, only to be followed by a standing ovation that Netanyahu received when he addressed Congress. Netanyahu showed that both Democrats and Republicans were united in backing Israel’s position and rejected Obama’s demand concerning the 1967 lines being a starting point in future peace negotiations. This was the last major fight picked with Israel by Obama over the peace process. In the ensuing months he launched a Jewish charm offensive with an eye on the 2012 presidential election. Obama, the narcissist that he is, hasn’t forgotten, and hasn’t forgiven. Interfering in Israel’s elections and attempting to spoil Netanyahu’s re-election chances is simply payback with more to follow. The following is probably the expected scenario in the period following Israel’s election and the expected re-election of Netanyahu; Obama will be telling associates he does not believe a word that comes out of Netanyahu’s mouth. Obama will state that does not trust Netanyahu and does not consider him an ally – someone he can move things forward with. Obama will claim that Netanyahu will not look out for Israel’s interests and will cause the international community to view Israel as a pariah state. Those who are familiar with Obama’s analysis of the Middle East know that he has long since claimed that without a two-state solution Israel will not be able to preserve a Jewish majority. He has said this in the past, also publicly. Now he is calling the one who is to blame by name: Netanyahu. The president of the United States will want to save Israel from its leadership. After being burned over the past four years in his dealings with Netanyahu, the president will be pointing a finger at the person who started the fire. Obama will be taking on help to keep up the pressure on Netanyahu. Much has been written in recent weeks about Obama’s nominee’s for the three most important cabinet positions; Hagel for Defense, Kerry for State, and Brenner to head the CIA. All three nominees’ are long term critics of Israel, and overly understanding of the Islamic world, never ever expecting any level of accountability from Islamic leaders, sound familiar? Obama will not be wasting his precious time or his personal prestige during his second term on the Arab-Israeli conflict. Obama will not come out publicly against Netanyahu. 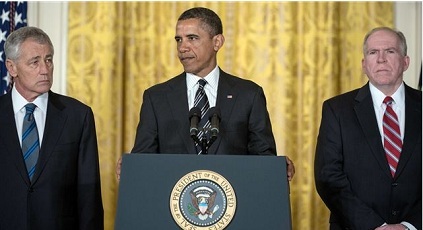 Obama will send these three men, Hagel, Brennan and Kerry, to make sure that Netanyahu does not sleep quietly at night. They will sustain Obama’s narcissistic rage towards Netanyahu every day and at every opportunity. The United States and Israel do not have a symmetrical relationship, however, Obama and his three nominees would be mistaken to assume that Israel has no options other than to capitulate to Obama and his dictates. The political, cultural and yes religious alliance between the United States and Israel is getting stronger especially during the past four years of the Obama administration to his chagrin and frustration. This bilateral relationship is now so fully embedded and integrated into the infrastructure of the U.S. defense establishment and in her foreign policy as to be virtually indestructible. Obama who is at best ambivalent about Israel and determined to create daylight between the two countries will learn, despite his pathological narcissistic belief that he knows what’s best for Israel, that not even Obama or his three expected nominees will be able to downgrade the alliance between the United States and the State of Israel. With Obama it goes far deeper than narcissism. The rage that fuels Obama is satanic. Netanyahu goes into tomorrow with many advantages. Despite mediocre approval ratings , voters see him as the only plausible prime minister in the field of contenders. And despite the disappointing performance of his Likud Party’s alliance with indicted (now-former) Foreign Minister Avigdor Lieberman’s ultra-nationalist Yisrael Beiteinu (“Israel Our Home”), the bloc is still poised to win twice as many seats as its closest competitor. But Netanayhu’s invincibility always lay less in the power of his personal brand or that of his party than in the total parliamentary strength of the right-wing parties that make up the core of his coalition: Likud, Yisrael Beiteinu, the ultra-Orthodox parties (Shas and United Torah Judaism), and the pro-settler HaBayit HaYehudi (“Jewish Home”). Dense, you are so correct, This is the most evil man that we have ever had in the WH. Self serving, and no regard to the wishes of the American people. Only those that want a ride from the hard working people of America. We are tired of supporting the lazy bums, and all the people that are here illegally. I don’t know the answer only God can help us out of this mess. Remember Obama only has half the support of the American people. Many of us see him for who he is. First, he is full of pride – and it is only a matter of time before he falls. Second, every tongue that speaks out against God’s people will be judged. God said it and God must honor his word. Obama is anti-Israel but he is also anti-Christian, anti-constitution, anti-freedom of speech, anti-right to bear arms. He is pro-Islamist, a false religion which God will destroy.